In February 2013 Joe taped his second half hour special for Comedy Central, and in September of that year he released his third standup comedy album You Will Die. 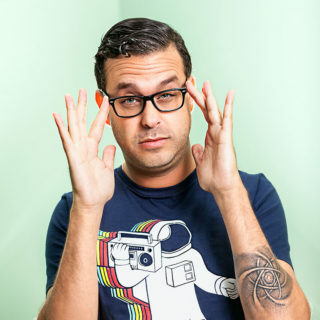 His first two standup albums, The Depression Auction and Return of The Son of The Depression Auction, were released on Comedy Central records in 2010 and 2011 respectively. A fourth album, “Mistakes Were Made: The B-Sides” was released in August of 2014. Joe has also worked as a writer on a variety of projects, including Netflix’s highly anticipated Wet Hot American Summer TV series, Comedy Central’s Jeff & Some Aliens, and TBS’ acclaimed The Pete Holmes Show, on which he was also a featured performer. Online, Joe created, wrote, and starred in Bedrocket’s 2013 web series We Should Break Up and the Warner Brothers web series What Are We Waiting For? In 2011 he directed and, along with fellow comedians Bill Burr and Robert Kelly, co-wrote and starred in the short film CHEAT, which premiered at The Tribeca Film Festival that year. In October 2012, Simon and Schuster released a book based on the film, written by the three comedians themselves. In recent years, Joe has been seen in a recurring role on AMC’s Better Call Saul, and has made appearances on Comedy Central’s Inside Amy Schumer, FX’s Louie, HBO’s Bored To Death, E’s Chelsea Lately, and in the video game Grand Theft Auto V. This year, Joe released his first full televised hour special, You Let Me Down. When he’s not writing or acting, Joe headlines comedy clubs across the globe and has been featured at renowned festivals such as South By Southwest, Montreal’s Just for Laughs, The Moontower Comedy Festival, The New York Comedy Festival, Gilda’s Laughfest, Melbourne International Comedy Festival, and Bonnaroo.